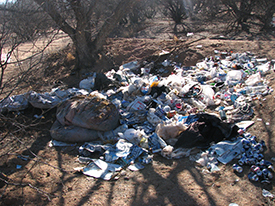 ADEQ's solid waste program's responsibilities includes permitting and corrective action for solid waste facilities, performing inspections and providing compliance assistance, and advocating solid waste reduction, reuse and recycling. The maps below contain data found in files at ADEQ or GPS data collected by ADEQ staff. The locations represented on these maps are registered sites and facilities only. Not all of the locations represented on these maps are open for public use. When this is the case, the maps will make this distinction. When any location's permit status becomes closed it will be removed from every map. However, its location information is maintained in a GIS format for future use. In 1990 Arizona promulgated laws for managing used oil under Arizona Revised Statutes § 49-801 et. al. These laws include both regulatory provisions and enforcement provisions for managing used oil. In 1997, the regulatory provisions were replaced when Arizona adopted, by reference, the federal regulations for managing used oil, under 40 Code of Federal Regulations, Part 279 (40 CFR 279). As a result, Arizona's used oil program now consists of the regulatory provisions contained in 40 CFR 279, and additional regulatory provisions that were deemed appropriate for Arizona, and the enforcement provisions. To learn more about Arizona's used oil program, choose from the topics below. These topics are offered to provide general background information about Arizona's used oil program, and are not a legal interpretation of the law. For more complete information about used oil management, or the enforcement provisions, refer to the state statutes and the federal regulations, referenced above. Where Does Used Oil Come From? Where Can I Take My Used Oil?